This magazine is always a pleasure to assemble, and I think you'll really enjoy it, even if you've never picked up a tenkara rod. 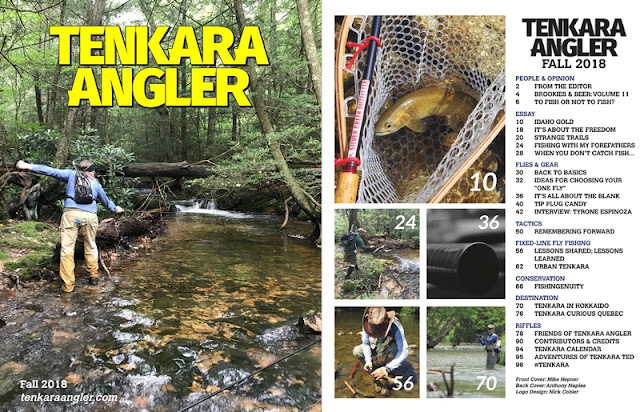 One of the challenges/themes for the contributors in this issue was to provide the readers with some tenkara lifestyle stories. Not necessarily "how-tos" but rather accounts of experiences, outings, and adventures. Those experiences apply for any angler. The essays from Brad Trumbo, Keith Anderson, Brittany Aae, Mike Hepner, & Nick Pavlovski certainly do not disappoint. Now we didn't neglect other subjects, such as kebari (flies), gear, interviews, tactics, warm water fixed-line fly fishing, conservation, and destination. 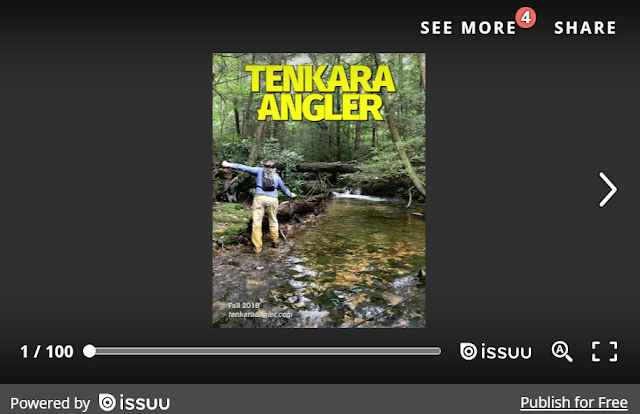 The article about tenkara in Hokkaido, Japan by the founder of Tenkara USA, Daniel Galhardo is excellent. Another superb issue. Thanks for all your hard work.